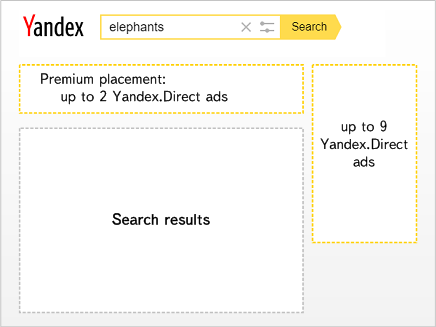 Context ads from Yandex.Direct are displayed in ad blocks for search results. 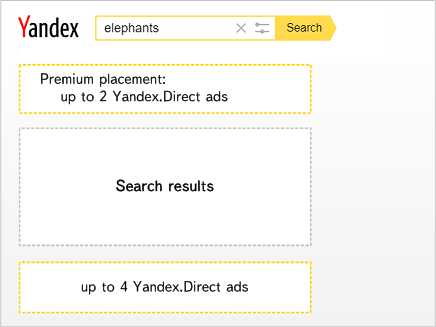 A partner may place two ad blocks on a page: Premium Placement and Yandex.Direct for search results. The maximum number of ads per page is 12. A Premium Placement ad block must be positioned above search results, while search blocks from Yandex.Direct can be positioned to the right, just like on Yandex search results pages. A Premium Placement ad block must be positioned above search results, while a Yandex.Direct search ad block is placed below the search results.